The National Archaeological Museum of Venice, situated in the Procuratie Nuove, can be legitimately defined as the heir of the ancient Public Statuary of the Most Serene Republic of Venice, the founding nucleus of the collection partially rearranged in the Vestibule of the National Library of St. Mark’s. The Archaeological Museum boasts an extraordinary collection of Roman and Greek sculptures, as well a large number of ancient coins, marvellous gems and cameos, bronze artefacts, pottery, Egyptian and Assyrian-Babylonian antiques and prestigious findings from the Late Antiquity period. The National Archaeological Museum of Venice has its most remote roots in the establishment of the Public Statuary of the Most Serene Republic of Venice, set up in the late 16th century thanks to the donations made by Domenico and Giovanni Grimani. Originally situated in the Antechamber of the Libreria di San Marco (St. Mark Library), current Vestibule of the National Library, the Statuary has been one of the first public museums on ancient art in Europe and for centuries it served as a renowned and highly visited cultural point of reference. In 1812 it was moved to Palazzo Ducale (the Doge’s Palace) and during the 1920s it was moved again to the rooms of the former Royal Palace, where it is still situated. Prof. Carlo Anti was in charge of the then layout. More recently, in 1997, two walls of the Public Statuary inside the Vestibule of the National Library have been renovated. The museum, which also hosts private collections, is part of the network of the so-called “musei marciani” (museums of St. Mark’s) together with the Doge’s Palace, Correr Museum and the National Library of St. Mark’s. The first room of the museum hosts interesting stone artefacts, including funerary steles and Greek inscriptions related to treaties of alliance signed by Cretan cities (2nd century BC), as well as reliefs and fragments of Roman sculptures (high relief with Mithras and a bull, foot of a colossal statue). 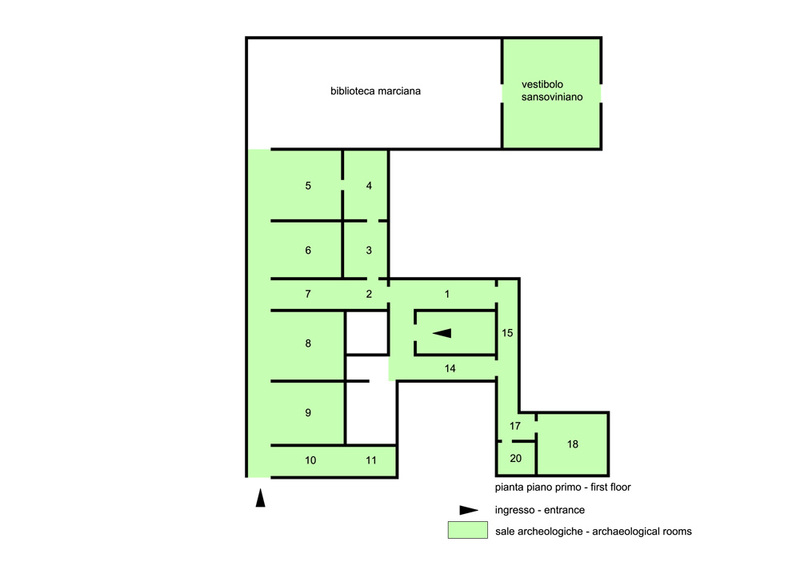 The second room of the museum is formed by an aisle leading to the rooms which house a collection of Greek statues. The display cases aligned along the walls host a restricted selection of the very rich numismatic collection of the museum (almost 9000 pieces), with coins dating back to a broad time span ranging from the Greek age to the Byzantine period (some are undergoing renovations). 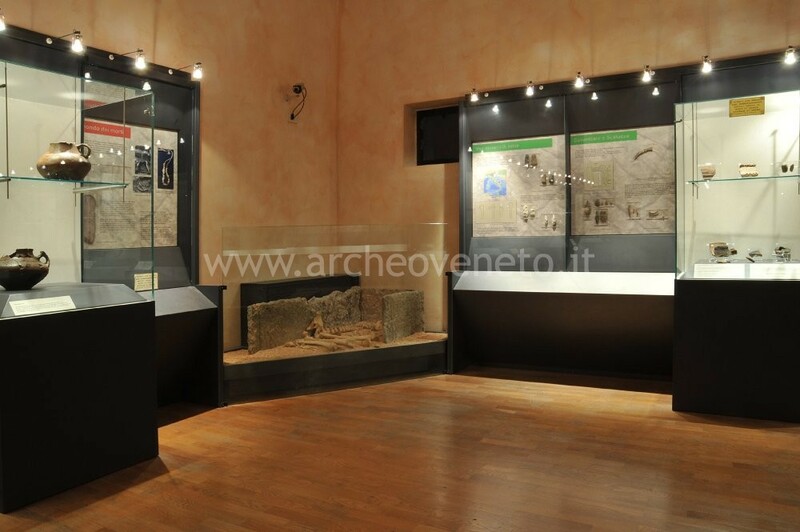 The display cases also host Roman coins found in two hideouts in Meolo and Martellago. The so-called “chronological path” through the extraordinary collection of Greek and Roman sculptures of the museum starts in this room which mainly houses Roman copies of Greek sculptures from the 5th century BC. In order to make the visit easier, each artefact is marked by a number, although the statues are not always ordered numerically. Along the left wall, there is a statue of Artemis in Archaic style (no.1; mid 1st century AD), with a plaster head which is the model of a Pompeian copy; the head of Hermes (no. 2), Roman replica of the Attic original statue in bronze (mid 5th century BC), attributable to Agoracritus; the head of Kore (no. 4), Roman replica of an original statue in bronze, a work of the circle of Calamis (mid 5th century BC). On the back wall, on the two sides of the door, there are two twin statues of large dimension depicting the Caryatids (no. 5 and 6). They both date back to the 2nd century AD and are an example of Roman classicistic revision of a model from the second half of the 5th century BC; the head of statue no. 5 (acephalous) is a plaster copy of statue no. 6. Along the right wall, noteworthy are a female head which originally belonged to an Attic high relief from the first half of the 4th century BC and a big composite candelabrum (no. 10) remade using old (last quarter of the 1st century AD) and modern elements. Unlike the artefacts exhibited in the previous room, this room hosts original Greek sculptures exclusively. These sculptures come from different areas of the Aegean Sea (Greece, Crete, Asia Minor) and are part of Giovanni Grimani’s and Federico Contarini’s collections. They date back to time span ranging from the late 5th century to first half of the 4th century BC. Noteworthy is the high number of female statues, smaller than life-size, called “peplophoroi” (wearing the peplos) depicting deities and offerants. Among these sculptures, probably originally situated in an ancient Greek sanctuary, particular attention should be paid to the two statues of Demeter (no. 5 and 6) that can be related to one made by Cephisodotus, from Attica (first half/mid 4th century BC); a statue of Kore, a work of the Ionic school, dating back to the early 4th century BC; the so-called “Abbondanza Grimani” (Grimani abundance) (no. 11), a work of the Attic school (late 5th-early 4th century BC), restored during the Renaissance. Noteworthy is also the statue of Athena (no. 10), a work of the Attic school (circa 410 BC), with a Roman head from the 2nd century AD assembled over the body on occasion of the Renaissance restoration. Room no. 5 mainly contains Greek sculptures from the 5th-4th century BC and Roman copies of other Greek statues from the Classic period. Among the original Greek sculptures, noteworthy is a set of funerary reliefs and votives from Attica (no. 7, 8, 9, 11, 14; 5th-4th century BC); the head of Athena, similar to the Athena Parthenos made by Phidias, without metallic helmet, a work of the Attic school (no. 2; first half of the 4th century BC); another head of Athena, a work of the Scopadean school (no. 19; second half of the 4th century BC) and a big acephalous statue of Nike from Crete by Damokrates of Itanos (2nd century BC), on the left hand side of the entrance. Among the most representative examples of Classic Greek sculptures from the 5th-4th century BC shown through the numerous copies made during the Roman Imperial age there are Athena Velletri-type by Kresilas (no. 5, 18), the statue of Asclepius, attributable to Timotheos, Apollo Lyceios by Praxiteles (no. 1) and two heads of Meleager (no. 20) and Dionysus (no. 27), works of the Scopedean and Lysippos schools respectively. The room is devoted to Lysippos and is a sort of introduction to Hellenistic artefacts. Examples of Lysippos’s sculptural works are the Roman replica of Eros with arch (no. 1), whose original statue in bronze is in the Temple of Aphrodite in Thespies (320 BC) and the Attic copy of the head of Silenus from the 2nd century AD (no. 10; late 4th century BC). The bronze copy of the Worshipper of Boedas (no. 5) by Lysippos’s son dates back to Renaissance. Besides some portrait sculptures dating back to the 3rd-1st century BC (no. 13, 14, 17, 18) and other examples of the Hellenistic sculpture, noteworthy are the Roman copy of a group of Dionysus with Satyr from the second half of the 2nd century BC and most of all the so-called “Gramani altar”, an impressive base of a statue, finely decorated with vegetable friezes and Dionysian reliefs, perhaps from Rome (1st century BC), placed in the middle of the room. This aisle interrupts the “chronological path” and reconnects to Room 2. Along the walls there are two sets of display cases which contain different kind of objects, including Lysandra funerary stele from Izmir, in Turkey (second half of the 2nd century BC). The display cases on the left exhibit outstanding objects expression of sumptuary art, such as bronze and silver objects, golden jewels from the Dalmatian necropoleis of Asseria and Aenona, as well as a selection of gems, ivory objects and silver pottery (this section is partially under repairs). Among the cameos, noteworthy is the so-called “Zulian cameo” in onyx, depicting Jupiter Aegis. The display cases on the right contain an interesting collection of bronze artefacts from different places (Ligabue collection, Etruscan and Roman bronze statues, bronze statues with Greek and Latin inscriptions). The wonderful silver plate from Late Antiquity depicting a scene of Athena bathing, from Castelvint di Mel, near Belluno, will be soon exhibited in this room. The room is entirely devoted to Hellenistic sculpture. Besides an original votive relief of Cybele and Attis (no. 16), it is worth noting the group of copies of statues from the Roman Imperial age dedicated to different figures: Eros and Psyche (no. 1), Hermaphrodites (no. 5), Satyrs (no. 2, 4, 13), Ulysses (no. 25; copy of Pergamonian original from the first half of the 3rd century BC) and most of all the defeated Galatians, placed in the middle of the room. They are Roman replicas of three famous bronze statue of Pergamonian art, dating back to the 2nd century BC: a Galatian about to fall (no. 26), a Galatian kneeling down (no. 27) and a dead Galatian (no. 28). The last two rooms of the “chronological path” have a strong visual impact on the visitor thanks to the magnificent sequence of Roman portrait sculptures dating back to the 1st-3rd century AD. Portrait sculptures exhibited in this room and in the following one include a portrait of Pompey, several emperors starting from Augustus, some dominae of Imperial families and also various eminent figures of the early and middle Imperial period. A useful panel with the genealogy of all Roman Emperors from Augustus to Caracalla helps understanding the exhibition. Besides ancient portrait sculptures, there are also some from the Renaissance period inspired to Roman models, such as the so-called “Vitellio” in bronze which stands near the original one in marble. On the back wall there is a male honorary statue found in 1766 in Abano, near the sacred thermal spring for the veneration of God Aponus. Room no. 10, smaller than the previous one, concludes the sequence of Roman portrait sculptures. Here, the “chronological path” ends. The walls of this small room are decorated with Roman reliefs, including those with putti, known as “Throne of Saturn” (1st century AD) from Ravenna. In the middle of the room there is a display case which contains the precious capsella of Samagher (near Pula, Istria), a silver and ivory reliquary finely manufactured and decorated with elements from the Christian tradition (5th century AD). This room hosts a set of reliefs, urns and altars, all with a funerary function. Noteworthy is the funerary relief depicting the story of the two Argive brothers, Kleobis and Biton (mid 2nd century AD). This room houses several funerary and votive inscriptions, as well as two large display cases which contain an interesting collection of ceramic vases. The first display case exhibits artefacts in ceramics from Mycenae and Cyprus. The second one displays artefacts in ceramics from Gnathia, black painted pottery as well as Etruscan and ancient Venetian pottery. Most of the vases exhibited are very well preserved; particularly noteworthy is a Villanovan funerary urn. The theme of this small room is quite heterogeneous. It contains “other ancient artefacts” not included in the previous rooms. Among the sculptures exhibited, noteworthy are a Greek votive relief depicting Dionysus and offerants (4th century BC), a Greek and two Roman funerary reliefs, the head of Alexandrian Pan (2nd century BC) and three interesting “cube” statuettes from Egypt. This room too contains “other ancient artefacts” from Correr collection. Here there are mainly Greek sculptures, Roman copies of original Greek statues (including Hermes Propylaios by Alkamenes) and Roman portrait sculptures. On the right wall there are three heads in black stone, work of the Alexandrian school (1st century BC). The room displays numerous Egyptian and Assyro-Babylonian antiques. First of all, the visitors will note the two mummies, which are placed in the display case in the middle of the room; also a few statuettes and canopic jars can be traced back to Ancient Egypt. Particularly noteworthy among the finds of eastern origin are the fragments of reliefs from the Palaces of Nineveh and Nimrud, decorated with parade, battle and hunting scenes (9th-7th cent. B.C. ), which were donated by the English archaeologist Austin Layard. The room also contains an anthropoid sarcophagus from Cyprus (6th cent. B.C.). In the Vestibule of the National Library of St. Mark’s, former Antechamber of St. Mark Library, two of the walls of the ancient Public Statuary of the Most Serene Republic of Venice can be seen. They have been rearranged on occasion of the exhibition organized for the 400th anniversary of the early layout of the Antechamber (1997). They are the entrance wall and the wall towards the bookshop, skilfully rebuilt adopting a philological method thanks to the accurate catalogue issued by Anton Maria Zanetti the Young in 1736. Two panels have been recently placed in the Vestibule with the two drawings made by Zanetti the Young portraying the walls rebuilt in 1997. The panels also include captions about each work. The room in an integral part of the visit to the museum. (EU students aged between 15-29, escorts (max 2 escorts per group), seniors +65, staff of the Ministry of Cultural Heritage and Environmental Conservation, Rolling Venice card holders); free: residents of the Municipality of Venice, children aged between 0-5, disabled person and helper, authorized tour guides, tourist interpreters accompanying a group, group leaders – groups of 21 people or more (advance booking required), ICOM members. Access for visitors through the Correr Museum (Piazza San Marco, Napoleonic wing, Monumental staircase). Ticket office at Correr Museum closes one hour and half before the Museum; ticket office at Archaeological Museum closes half an hour before the Museum. Closed on Christmas day and New Year Day. In each room there is an information panel. 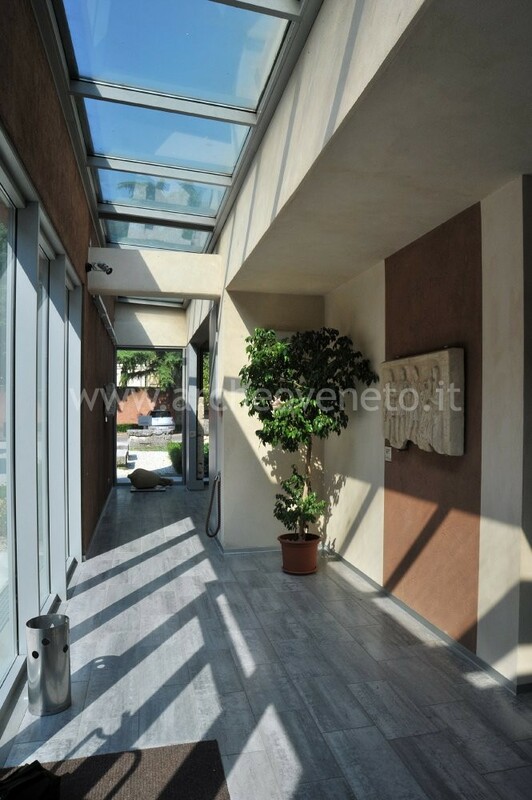 In each group of rooms which share the same theme there are one or more information sheets in Italian, English and French; in some rooms, information sheets for children are also available (in Italian). Information sheets in English and French, information sheets for children in French, panels in English and French. Available on demand. Free guided tours at the National Library every Sunday (except for the 4th Sunday of the month) at 10am, 12am and 2 pm. Available on demand. The activities are organized by the association “Amici dei Musei e Monumenti Veneziani”. For the exclusive use of the management. Forlati Tamaro B. 1969, Il Museo Archeologico del Palazzo Reale di Venezia, Roma. Traversari G. 1970, Sculture greche e romane del Palazzo Reale di Venezia, Venezia. Traversari G. 1973, Sculture del V-IV sec. a.C. del Museo Archeologico di Venezia, Venezia. Polacco R. 1981, Marmi e mosaici paleocristiani e altomedievali del Museo Archeologico di Venezia, Roma. Traversari G. 1986, La statuaria ellenistica del Museo Archeologico di Venezia, Roma. Sperti L. 1988, Rilievi greci e romani del Museo Archeologico di Venezia, Roma. Traversari G. 1988, Sculture romane e avori tardo-antichi e medievali del Museo Archeologico di Venezia, Roma. Lo Statuario Pubblico della Serenissima. Due secoli di collezionismo di antichità (1596-1797) 1997, a cura di Favaretto I. Ravagnan G.L., Venezia. Nardelli B. 1999, I cammei del Museo Archeologico Nazionale di Venezia, Roma. Ravagnan G.L. 2003, Le gemme e i cammei del Museo Archeologico Nazionale di Venezia, Venezia. Musei e raccolte archeologiche del Veneto 2004, a cura di Di Mauro A., Dosson di Casier, pp. 95-99. Museo Archeologico Nazionale di Venezia 2004, a cura di Favaretto I., De Paoli M., Dossi M.C., Milano. Bonetto J. 2009, Veneto (Archeologia delle Regioni d’Italia), Roma, pp. 429-432.